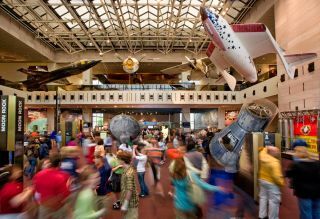 The Milestones of Flight Gallery, the main hall of the Smithsonian's National Air and Space Museum, will undergo an extensive renovation, to be completed in 2016 for the museum's 40th anniversary in 2016. The expanded exhibition will trace the interconnected stories of the world's most significant aircraft and spacecraft, with digital displays and technology mobile experience in a new design. The Smithsonian's National Air and Space Museum is set to redefine the "Milestones of Flight," as it begins the first major renovation of its most iconic gallery. The institution Thursday (April 3) announced that Boeing had donated $30 million in support of the Washington D.C. museum's educational activities and exhibitions, including the extensive redesign of the "Milestones of Flight" gallery in the museum's main hall. The hall's redesigned layout, which will span between the museum's two main entranceways, will feature new digital displays and an integrated mobile experience. "We're grateful to Boeing for this magnificent contribution," Gen. J.R. "Jack" Dailey, the museum's director, stated. "It will enable us to create an exciting new exhibition concept inspired by innovators, from the Wright brothers to today's space explorers, and to develop educational experiences for generations of innovators to come." In response to Boeing's gift, which is the largest corporate donation in Smithsonian history, the gallery will be retitled the "Boeing Milestones of Flight Hall." When the museum opened almost four decades ago, the word "milestones" was defined by curators as "the first" in flight or space travel. The hall's original artifacts included John Glenn's Mercury capsule "Friendship 7," the first American spacecraft to orbit the Earth; Apollo 11's command module "Columbia," the first spacecraft to fly astronauts to land on the moon; Charles Lindbergh's "Spirit of St. Louis," the first aircraft to fly non-stop across the Atlantic Ocean; and, at its center, the Wright brothers' Flyer, the world's first craft to achieve powered flight. In the years since, the gallery added a few more air- and spacecraft, including the Breitling Orbiter 3 gondola, which made the first nonstop flight around the world by a balloon, and SpaceShipOne, the first privately-built, piloted vehicle to reach space. The hall's most notable change however, came in 2003 when the Wright Flyer was moved to its own dedicated gallery. The artifacts to be displayed in the expanded gallery were chosen by curators to tell multiple stories and they will be organized to connect themes. Some of the objects, such the "Spirit of St. Louis," Glenn's "Friendship 7," and Chuck Yeager's Bell X-1 supersonic jet will be familiar to visitors because they were part of the original "Milestones" hall. But other items — the Apollo Lunar Module, for example, Telstar satellite and the model of the "Starship Enterprise" used in the "Star Trek" television series — will be making their "Milestones" debut. Noticeably absent from the redesigned gallery will be the Apollo 11 command module, the capsule Neil Armstrong, Buzz Aldrin and Michael Collins flew to the moon in 1969. "Columbia" is set to become the new centerpiece of the gallery presently known as "Apollo to the Moon," which is also scheduled to undergo a renovation to share the story of NASA's Mercury, Gemini and Apollo programs. The Milestones of Flight gallery draws a large crowd of visitors in the newly opened National Air and Space Museum, as seen in this photograph taken December 28, 1976. The "Milestones of Flight" gallery, which is the museum's central and largest space, has had more or less the same layout since the museum first opened July 1, 1976. More than 310 million visitors have passed through the gallery during the museum's 38 years of operation. The new installation, according to the museum, will give the gallery a streamlined "21st century look" with features themes and displays aimed at today's visitors. The square footage of the exhibition will be enlarged, and the displays will take full advantage of the atrium's two-story height. One of the more engaging differences will be the addition of a new media wall and kiosks, which will allow visitors to see artifacts in different contexts, look them up by topic or theme and connect to other sources of information. A new sign system will help the visitors find other artifacts and galleries more easily, and a larger, more centrally-located welcome center will enable the museum to assist a larger number of guests more quickly and efficiently. As the "Milestones" gallery also serves as the entrance to the museum, it will remain open during its renovation, with only sections of it being closed off as work is undertaken to complete the redesign. In addition to the "Milestones" project, Boeing's donation will also fund upgrades to several other galleries, including the museum's "How Things Fly" hall, and will support the John H. Glenn Lecture in Space History, an annual event. "We are honored to help preserve the legacy of pioneers who transformed an industry and influenced generations of innovators," Jim McNerney, Boeing's chairman and chief executive officer, said in a statement. "By supporting the National Air and Space Museum with the renovation and expansion of the ["Milestones of Flight"] gallery, we hope to inspire others to dream, design and build the next game changers in aerospace history." Click through to collectSPACE to watch a video about the new "Milestones of Flight" gallery at the National Air and Space Museum.